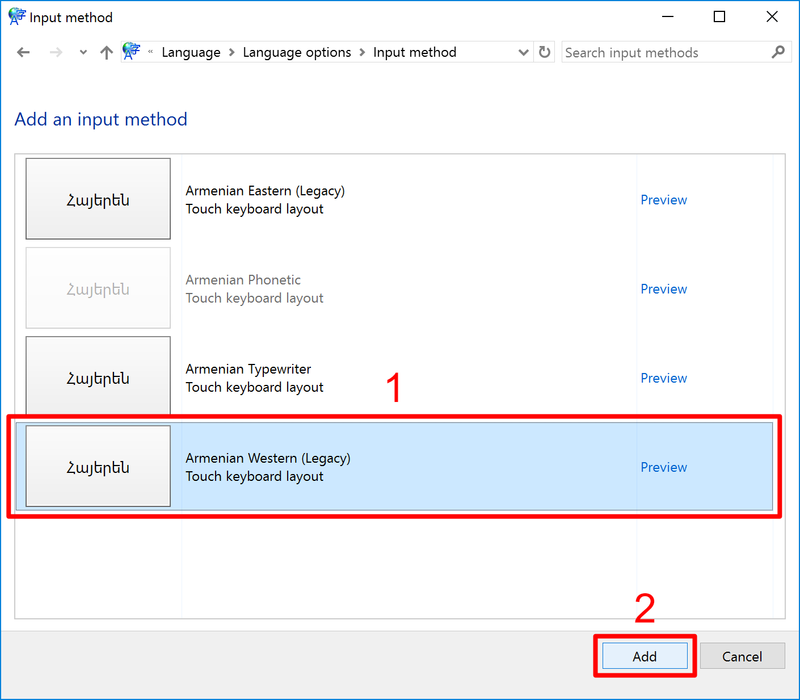 This guide will explain how to configure Microsoft Windows 10 to be able to write using the Armenian alphabet. Microsoft’s Windows 10 operating system supports Unicode, an encoding standard that allows your computer to handle texts in most of the world's writing systems, including Armenian. Whereas displaying Armenian text doesn’t require any configuration, typing in Armenian requires a little configuration on your part. 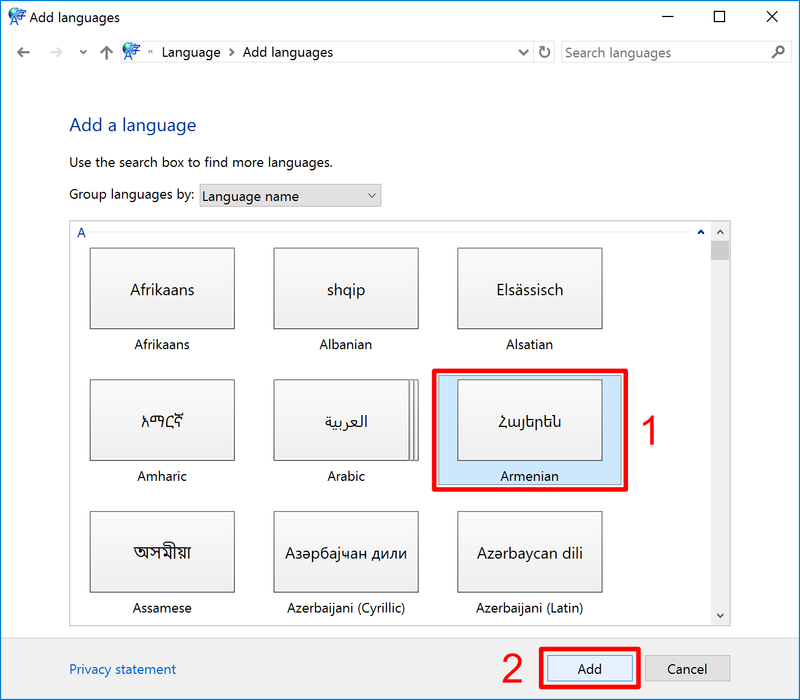 To be able to write in the Armenian script, you must add Armenian as an Input Language to Windows 10. This will allow you to use your existing keyboard to input Armenian characters. For example, the “A” key may produce the Armenian letter “Ա”. 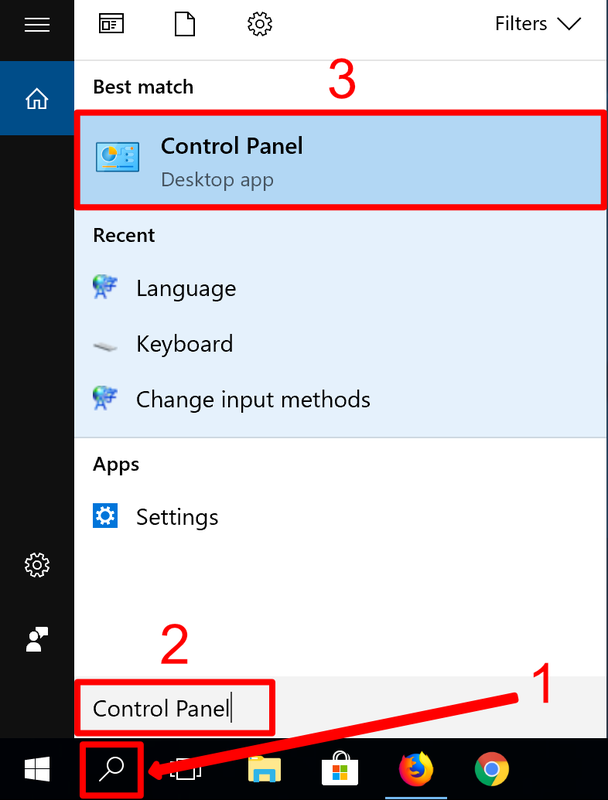 The following instructions will explain how to install and use the Armenian keyboard layout on Windows 10. 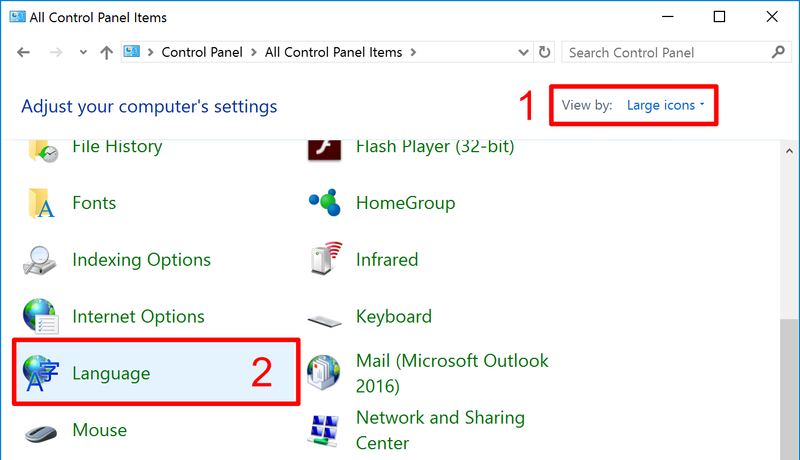 (1) Open the search box on the taskbar, (2) type control panel, and (3) then select Control Panel. (1) Make sure that View By: Large icons is selected, and (2) select Language. Click on the Add a Language button. (1) Select Armenian and (2) click the Add button. 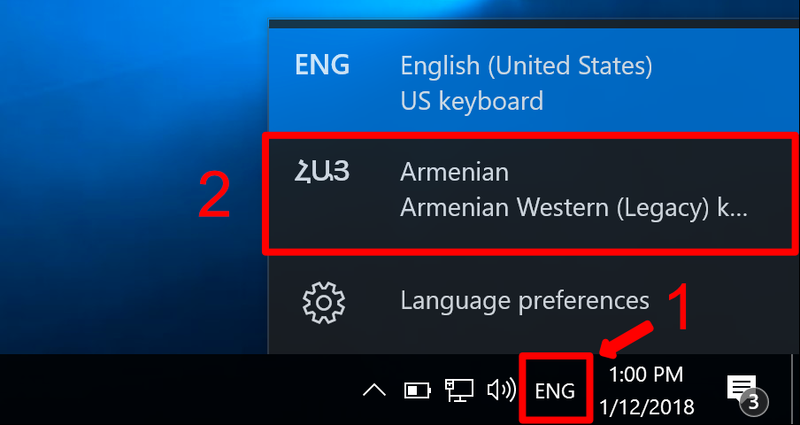 (Optional) By default, Windows 10 has configured the Armenian Phonetic keyboard layout, which is the predominant one used in the Republic of Armenia, and roughly corresponds to Eastern Armenian (for example, “B” is mapped to the Armenian letter «Բ»). If you prefer another keyboard layout, such as Western Armenian (where for example, “B” is mapped to Armenian letter «Պ») then continue following the instructions below. Click on the Options link in the Հայերեն language section. (Optional) Click on the Add an input method link. (Optional) (1) Select the Armenian Western layout, and (2) click Add. 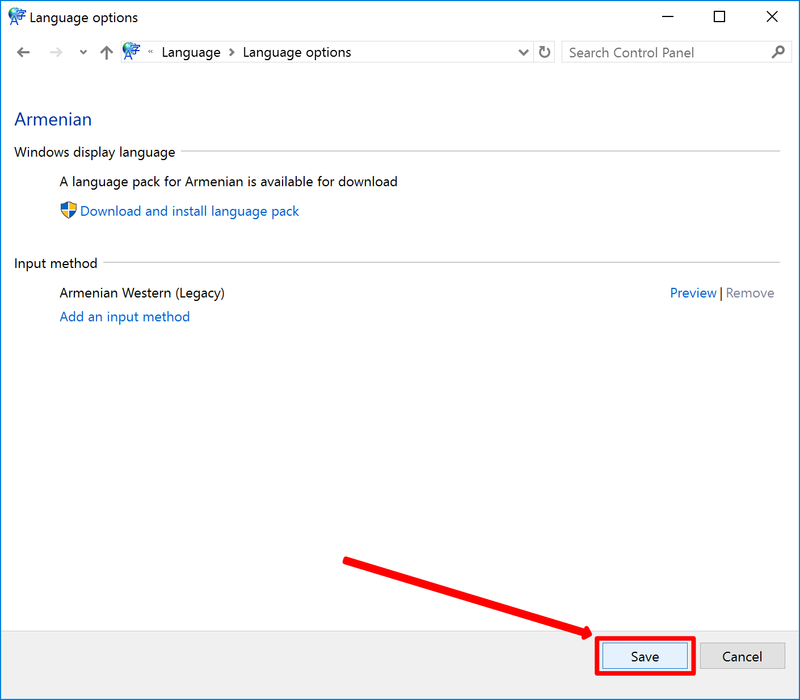 (Optional) Remove the Armenian Phonetic layout by clicking its Remove link. (Optional) If you don’t know which key corresponds to which Armenian letter, click the input method’s Preview link to view the keyboard layout. (Optional) A new window will appear displaying the keyboard layout. Click the Close button once you’re done learning the layout. (Optional) Finally, click on Save to save your changes. 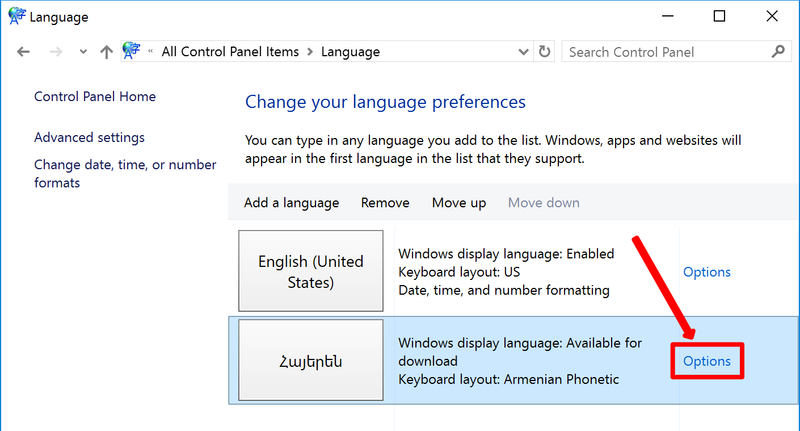 Windows 10 is now configured with an Armenian keyboard layout, and you are now ready to start typing in Armenian. Continue to the Usage section below to see how. Switch to the Armenian keyboard layout. There are two ways of doing this: using using the keyboard, or using the taskbar. The language abbreviation in the notification area at the far right of the taskbar indicates the keyboard layout currently selected. To switch keyboards using the taskbar, (1) click on the language abbreviation (e.g. ENG) and (2) select the Armenian keyboard layout. With the Armenian keyboard now selected, you can start typing in Armenian. You can switch back to English or another keyboard layout using the same method described in Step 2.